Top Hat is an online teaching platform designed to help professors and educators engage their students and build comprehension before, during, and after classes. The software offers solutions for delivering interactive courses, customizing digital textbooks, assigning homework, and securely administering assessments. Top Hat automates a variety of common, repetitive tasks to free up teachers' time, such as taking attendance and grading homework. Built-in assessment tools allow users to tracks students' progress throughout the term, with in-class questions and polls in addition to assigned homework, and provide feedback in real time to course-correct when necessary. Top Hat also aims to enhance student engagement with courses through integrated graphics and videos, customized interactive textbooks, class discussions, and lesson gamification. Top Hat's assessment solution allows students to take tests through their own device, whether a laptop, tablet, or smartphone, without downloading any software. Instructor-generated codes control access to the exam, and a proprietary behavioral algorithm automatically detects cheating. Homework tasks can be assigned to individuals or groups through the assignment solution, and users can create custom questions, import their existing materials, or choose free question packs in the Top Hat marketplace. Overall I am pretty happy with Top Hat. It would definitely fall in the upper end of programs I have used. The students also seem to enjoy it as well. I was able to log into Top Hat and immediately start using it without any training. It’s a pretty intuitive site. Seeing the grades and attendance is straightforward and has been easier to edit than other programs that I have used. I was able to log into Top Hat and immediately start using it without any training. It’s a pretty intuitive site. Seeing the grades and attendance is straightforward and has been easier to edit than other programs that I have used. When students are submitting their quizzes or comments there is major lag time and I am not sure if that is because of the software or internet connectivity. I am never entirely sure if I know how many people have turned in their questions. Until about 3 minutes after the questions is over. Also, I wish there was a way to edit slides when they are posted into Top Hat because when I upload sometimes the slides become distorted and I need to make the text smaller or rearrange it so that it fits on the screen and can be read. Also, sometimes the link to videos do not work. It has helped me so much with this class. It has given me a new way to go about grasping the material and I would highly suggest it to other people. I used it in my economics class, and we had embedded questions within our chapters. It really makes you slow down to understand and grasp the concepts. I used it in my economics class, and we had embedded questions within our chapters. It really makes you slow down to understand and grasp the concepts. We had problems with being able to go back and view which questions were answered correctly or incorrectly. I also wish there were more functions like notes and bookmarks along with the highlighting. I wish it were easier to view past questions or that there were some way to access the information presented with tophat at a later date, but overall is has been a very useful tool.I like the fact that this software allows you to answer anonymously in class, so I am not worried about getting an answer wrong and I am more likely to participate. The app itself is also very user friendly. I like the fact that this software allows you to answer anonymously in class, so I am not worried about getting an answer wrong and I am more likely to participate. The app itself is also very user friendly. I have noticed a few glitches with using this software, but nothing to keep me from not using it. I like that it is an easy and accessible way to share books, assignments and other content with the class. It's much easier then trying to share everything via email or printout. My only issue that I've had is that when the professor is doing a presentation I am unable to go in and do anything else on the class page even though she is presenting from a separate computer. Overall, I liked using this program to take the quiz's I needed to take for Veterinary School.I liked that it made it so I can pass my class with added quiz points. I also liked the format and layout of the program. It laid it out for each class so it was easy to find the questions and answers. I liked that it made it so I can pass my class with added quiz points. I also liked the format and layout of the program. It laid it out for each class so it was easy to find the questions and answers. Honestly, there wasn't anything I disliked about this software. Top Hat is free for professors, with students paying all course fees. 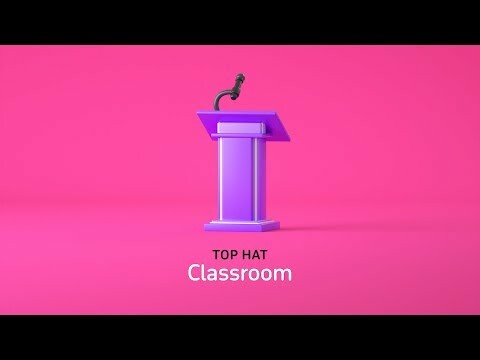 • Top Hat Classroom provides users with tools for delivering interactive courses to engage students, including attendance tracking through students' devices, embedded questions in presentations, real-time polls, and response data visualization. • With Top Hat Textbook, users can create custom digital textbooks for their students, utilizing videos, animations, and questions interspersed within content to engage learners. • Top Hat Assignment enables the assignment of homework tasks to individual students or groups, with options for importing existing materials, auto-grading of answers, and real-time feedback. • Assessments can be managed and securely administered through students' own devices with Top Hat Test, which uses proprietary behavioral algorithms to detect cheating and automatically lock out students. • Top Hat automates a range of common repetitive tasks, such as attendance taking and test grading, allowing users to focus their attention on important activities. Below are some frequently asked questions for Top Hat. Q. What type of pricing plans does Top Hat offer? Q. Who are the typical users of Top Hat? Q. What languages does Top Hat support? Q. Does Top Hat support mobile devices? Q. Does Top Hat offer an API? No, Top Hat does not have an API available. Q. What other apps does Top Hat integrate with? Q. What level of support does Top Hat offer?